The online world is a relatively new and diverse jumble of evolving business models and organizational structures. As a job seeker and a hiring manager it can be difficult to decipher the myriad of job titles in the market. As a specialist recruitment agency for online marketing jobs and e-commerce jobs, we have tried to provide a rough guide of standardized job titles and salaries in our market. What follows is a guide, not all roles in all companies fit this guide (for example. the Head of E-commerce for a top 10 online retail site is likely to earn more than the Head of E-commerce for a fledgling online store) but this gives a rough idea as to what our candidates do at each salary band. Variations include: PPC Executive, SEO Executive, Affiliate Executive, Online Advertising Executive, Partnership Executive, Online Acquisition Executive, Online Channel Executive, Email Marketing Executive. 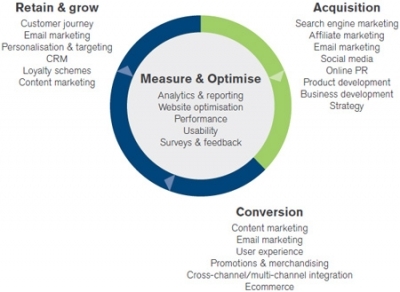 At this level, a role is often looking after one part of an online marketing plan. Variations include: PPC Manager, SEO Manager, Affiliate Manager, Online Advertising Manager, Partnership Manager, Online Acquisition Manager, Online Channel Manager, Email Marketing Manager, CRM Manager. At this level, a role usually becomes more strategically responsible for spending a marketing budget across all online channels and will often manage a team of online marketing execs/managers. Variations include: Head of Online Marketing, Online Marketing Manager, Head of Marketing, Head of Customer Acquisition, Customer Acquisition Manager. At this level, a role is often looking after one part of a website. Variations include: Website manager, merchandiser, analytics manager, conversion manager, online product manager, customer experience manager, user experience manager, category manager, project manager. At this level, a role is usually responsible for managing the commercial performance of a website and will often manage a team of e-commerce managers. Variations include Head of Web, Head of User Experience, Website Manager, Online Store Manager, Head of Online Sales. Project and Program managers tasked with the relaunch or overhaul of a website will fall into this category. At this level, a role is effectively P&L responsible for a website and will oversee all marketing (acquisition and retention) and Website User Experience (Conversion). A role at this level usually also includes offline/multi-channel and customer services responsibility. Variations include Head of Online, Director of Online, Marketing Director, Director of Direct Sales, Online Sales Director.